ramaponews students can sell Laboratory Techniques in Organic Chemistry (ISBN# 1464134227) written by Jerry R. Mohrig, Jerry R Mohrig, David Alberg, Gretchen Hofmeister, Gretchen Holifmeister, Paul F. Schatz, Paul F Schatz, Christina Noring Hammond and receive a $32.99 check, along with a free pre-paid shipping label. 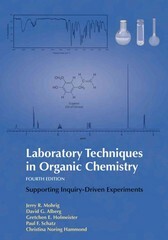 Once you have sent in Laboratory Techniques in Organic Chemistry (ISBN# 1464134227), your Ramapo College textbook will be processed and your $32.99 check will be sent out to you within a matter days. You can also sell other ramaponews textbooks, published by W. H. Freeman and written by Jerry R. Mohrig, Jerry R Mohrig, David Alberg, Gretchen Hofmeister, Gretchen Holifmeister, Paul F. Schatz, Paul F Schatz, Christina Noring Hammond and receive checks.